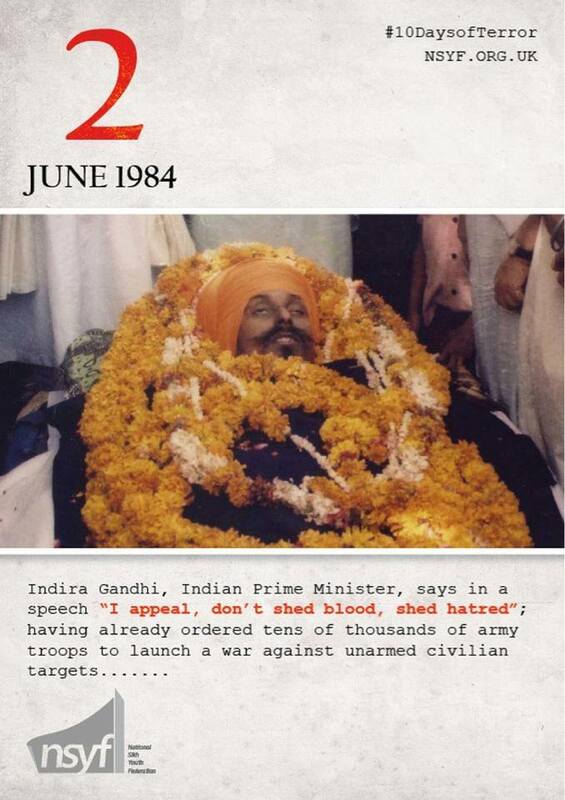 Indira Gandhi makes an address for peace to the nation, in the full knowledge that on her orders tens of thousands of army troops are planning to launch a full scale war against a mass of unarmed civilian targets inside and around the Complex. As she makes the address, those Sikhs murdered on the 1st June (Bhai Mengha Singh pictured) by soldiers on her command, are cremated. The telephone connections of the Golden Temple Complex are disconnected. The few armed Sikhs we see make up only a fraction of the population of Punjab. The Government also cuts off the entire Punjab State to the outside world, ensuring there are minimal witnesses to the carnage which is about to be unleashed upon it population. Today is Avtar Divas of Bhagat Kabeer Ji and Sant Jarnail Singh Ji Khalsa Bhindranwale.